Kevin Patrick came from Forest Hill High School in Lake Worth, Florida, where he was a standout two-way football player at tight end and defensive end, as well as getting playing time at fullback his senior campaign. An all-around athlete, he earned two letters in track, throwing the shot put and discus. Once at Miami, he focused his attention on playing just defensive end, and would make his defensive line coaches proud. After playing sparingly as a freshman, his 1991 sophomore year saw Kevin break into the starting lineup for 9 games, and, along with fellow sophomore, and Class of 2015 inductee Rusty Medearis, would wreak havoc on opposing quarterbacks with their aggressive and relentless pursuit, as the Hurricanes won their 4th National Championship ! As a junior in 1992, he fought off a shoulder injury, missing a couple of games, but still tied for the team lead with 8 sacks, and recorded 5 tackles for loss and 18 quarterback pressures, garnering him First Team All-Big East honors. 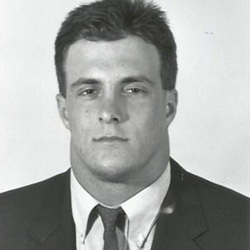 His senior year of 1993 was one to remember as Patrick was named the Big East Defensive Player of the Year and a First Team All American by the Associated Press and Kodak. He led the Canes in sacks (10) and tackles for loss (11) and was also named All-Big East for the second consecutive season. For his career, he recorded 23 sacks, fifth all-time in school history, along with 174 tackles. Kevin graduated Miami with a degree in business administration. Patrick and his wife, Rachel have two daughters, Grace and Belle.